If you were looking for clarity regarding the future of this Boston Celtics team heading into the postseason, you're not going to get it. As the 2018 NBA Regular season drew increasingly towards what seemed inevitable from the moment the NBA Finals matchups were set, LeBron2BOS picked up a steam few likely saw coming despite the unlikely nature of such an eventuality, and likely making the unanswered questions about Kyrie Irving's looming free agency at the end of next season even more difficult to divine. The All Star point guard only ended up in green after decamping from the Cleveland Cavaliers, reportedly threatening to get knee surgery just to avoid reporting to camp with the team last fall, triggering the deal which sent Isaiah Thomas to the Cavs (briefly), and Irving to a team where he gets to be the focus for a change. While that might not be the same thing as those who cast Irving's desire to have leadership of a team as a detestation of playing in LeBron James' shadow, one has to think that the media circus which follows the latter star around has become something of an obstacle to success in itself for those who surround the enigmatic talent. So, as one might imagine, the ramp-up in wishful thinking about James more than likely complicated already-fraught contract negotiations with Irving. We can't know more about his situation than he tells us, and what he's been saying has been mixed, to say the least. On one hand, he's actually seemed open to the possibility of playing with his former teammate, saying (per ESPN's Chris Forsberg), "In this business, I've experienced it all and I've seen a lot so we'll see what management decides. "...unless of course you take the glass-half-empty view here and see it as a veiled threat. Conversely, Irving seems more than ready to get back on the floor to compete for Banner 18, noting (per MassLive's Tom Westerholm): "The focus is solely on winning a championship next year...I don't think [his contract status] will necessarily have an effect. I'm doing my best to kind of deflect all that and focus on what's in front of us. ", which seems to be an earnest position, as he lit up when asked about getting Gordon Hayward back next season (per the Athletic's Jay King):"Now we have championship pedigree!" Two people could easily look at what Irving has said here and come up with entirely different - and rational - analyses of what his words signal. For me, I see plasticity and focus here worthy of a skilled, experienced negotiator. Plasticity in that he's choosing words which will minimize the distractions his free agency might cause a contending team to be distracted by. 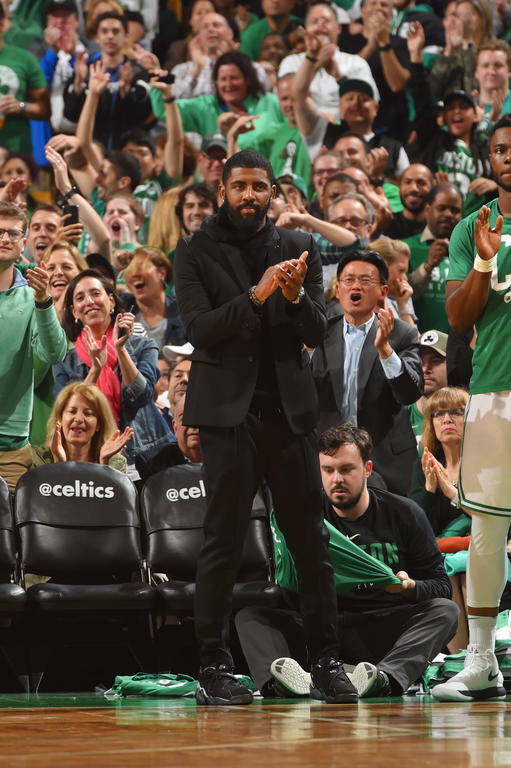 Focus in that his goal is winning another title, wherever fortune may place him - unlike James, Irving has not (yet) risen to the level to command his own destiny with no-trade clauses. But he is aware of the impact his decisions (and words) might have. Sound too noncommittal or even discontent, and he might find himself on whatever team Danny Ainge thinks best to deal with to avoid losing a colossal talent for nil, but the reverse might see him squarely back in the situation he got out of (albeit on a team with much, much better management). Whether it was LeBron or Dan Gilbert and his minions (or both) that rubbed Kyrie the wrong way, it's probably best for all involved to take the care required for maintaining focus come October. "You saw guys that literally are going to be stars in this league for years to come." For Boston, this probably means giving up on the idea of extending Irving, who cannot earn more than $108 million over the next four seasons if he extends, compared to the $139 million he could take home on another team over four years, should he opt out after next season. Mercifully, Boston can offer another year and more money than any other team, with a ceiling of $187 million over five years at their disposal. Does that mean he's a lock to resign with Boston once he gets to that point? Not exactly - recall Gordon Hayward, for example - or the fact that Kyrie may wish to resign at a two-plus-one, using that player option to get back on the market just when he could sign a tier-three max, worth whatever 35% of the cap will be in the year he signs it. And of course all of this could be clouded by other potential landing spots and moves made (or not) by his current team. So what is Kyrie signaling to us? "My hope is that maybe we could limit it to maybe one question a day about what I'm doing next year ... That's my hope."